Riley Luettgerodt battled for position against St. John's during yesterday's consolation game at the Outrigger Hotels Rainbow Classic. Luettgerodt finished with nine points in the Rainbows' 68-62 loss. In its first appearance in the Outrigger Hotels Rainbow Classic's consolation bracket in 12 years, Hawaii found a bit of solace in a spirited effort against St. John's. But that effort would ultimately go unrewarded, as late-game breakdowns contributed to the Rainbow Warriors' second loss of the tournament, a 68-62 defeat to the Red Storm before a sparse mid-day gathering yesterday at the Stan Sheriff Center. Two days after a disheartening first-round loss to Louisiana-Lafayette, the Rainbows Warriors came out strong to open the game and were within a point with less than 2 minutes left. But they again stumbled in the decisive final moments to suffer their fourth loss by six points or fewer this season. "It revealed the character of our team," UH coach Bob Nash said. "We could have dropped our heads and showed up today and gone through the motions. These guys came out and battled hard and had a chance to tie it up or win it. But, again, errors down the stretch stopped momentum." In a pre-Sugar Bowl matchup to close a less-than-sweet week for both teams, Hawaii (3-6) will face Georgia (6-4) at 11 a.m. today in the seventh-place game of the 44th annual tournament. St. John's (5-3) faces Tulane (7-4) in the fifth-place game at 1:30 p.m.
"In the locker room we said we gave a great effort and if we gave that great effort (Wednesday) we'd be playing at night (in the championship bracket)," UH senior Bobby Nash said. "But we just have to take it slowly and build from this and get better." In the wake of the opening-round loss, the Rainbows spent Thursday night in the arena to refocus as a group. "Everybody was focused on the game," senior guard Riley Luettgerodt said. "When the lights went out we just went to bed. No one's screwing around and we knew what we were trying to do the next day. We got up and we were ready to play." After a torrid shooting start for both teams (they were a combined 18-for-22 in the game's first 11 minutes), Hawaii managed to stay close after falling behind by 10 in the first half, drawing to within one at 60-59 with 3:36 left. But the Rainbows would go more than 3 minutes before scoring again, allowing St. John's to create enough cushion to hold on. Matt Gibson led the Rainbows with 17 points, while Nash finished with 12. Forward Bill Amis made all five of his shots to score 10 points. Hawaii's struggles from the perimeter continued, as the Rainbows went 2-for-17 from 3-point range and enter this morning's game having made just four of 32 3-pointers in the tournament. "That's not acceptable, we're a much better shooting team than that," Bob Nash said. Anthony Mason Jr. came off the bench to lead the Red Storm with 17 points on 6-for-8 shooting. David Gomez hit a 3-pointer from the top of the key with 6.5 seconds left to lift the Green Wave into the fifth-place game. Gomez made 11 of 17 shots from the field for a game-high 24 points. Guard Kevin Sims, who fed Gomez for the game-winner, finished with 15 points. Georgia center Jeremy Price scored 22 points on 9-for-13 shooting. 3-point goals -- St. John's 3-5 (Lawrence 1-1, Mason 1-1, Wright 1-2, Boothe 0-1), Hawaii 2-17 (Dillinger 1-5, Gibson 1-6, Nash 0-6). Personal fouls -- St. John's 21, Hawaii 22. Fouled out--Lawrence, Amis. Steals -- St. John's 7 (Kennedy 3, Lawrence 2, Burrell, Mason), Hawaii 6 (Gibson 3, Nash, Amis, Verwers). 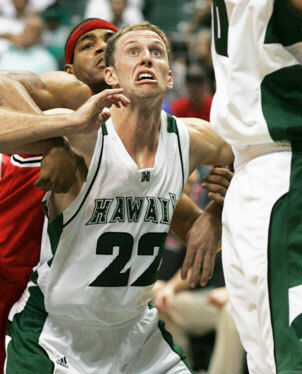 Blocked shots -- St. John's None, Hawaii 1 (Owsley). Turnovers -- St. John's 18 (Kennedy 3, Boothe 3, Burrell 2, Lawrence 2, Mason 2, Horne 2, Jasiulionis, Evans, Thomas, TEAM), Hawaii 16 (Gibson 5, Luettgerodt 2, Dillinger 2, Owsley 2, Verwers 2, Nash, Amis, Mayen). Officials -- Brian Shelley, Todd Apo, Tom Yoshida. A-- N/A.